The Dutch parliament has already voted in favour of a proposal to ban the burqa outside the home, and some in the government have thrown their weight behind it. There are only about 50 women in all of the Netherlands who do cover up entirely - but soon they could be breaking the law. 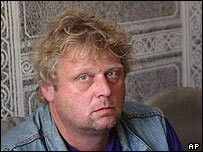 Dutch MP Geert Wilders is the man who first suggested the idea of a ban. "It's a medieval symbol, a symbol against women," he says. "We don't want women to be ashamed to show who they are. Even if you have decided yourself to do that, you should not do it in Holland, because we want you to be integrated, assimilated into Dutch society. If people cannot see who you are, or see one inch of your body or your face, I believe this is not the way to integrate into our society." I interviewed Mr Wilders inside parliament after several security checks. Two tough bodyguards stood close by throughout. This country, once the epitome of easy-going liberalism, is edgier, less tolerant these days. Famala Aslam is a Muslim lawyer who has represented women who have stopped wearing the burqa while training as child-care assistants. She would not cover her face herself, but does wear a traditional dress and headscarf from eastern Turkey. She showed me how that can be adapted. "Other women are stricter; and they hide the face - you can only see the eyes," she says. "And other women choose to wear the niqab, and they veil the face totally." I asked her what she would say to people who would say: "If you want to fit into the West, live here, wear a business suit; wear jeans - don't wear what you're wearing. Don't wear a niqab." Ms Aslam says she believes that the freedom of choice and the freedom of religion is something that people need to fight for. In the city of Maaseik, in Belgium - which lies a few hundred yards from the Dutch border - a ban on wearing the niqab is already in place. Mayor Jan Creemers said he brought it forward because old people were afraid and children cried when women started appearing in long black robes with their faces covered. 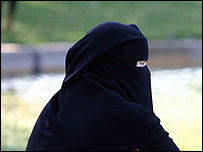 Women can now be fined 150 euros (£102) if they are found to be wearing the niqab. "There were six ladies who wore the niqab. I think two or three weeks after the council passed this law, five have dropped it," says Mr Creemers. "One lady is still wearing it but the last step in the procedure will be that she must go to jail." The husband of the woman who defies the ban is being held in connection with the Madrid bombings. But the police here are not too happy with the ban. They say it has made relations with the Moroccan community worse and gives young people a reason to resent society. Ms Aslam says if the ban becomes law in the Netherlands, some women will adopt the veil as a political statement. "A lot of women are not fully feeling like Muslims," she says. "But because of the public opinion, they are feeling like: 'I have to be a Muslim'. And banning or isolating a certain group of the population is just asking for problems." The Dutch government will soon decide whether to ban the burqa. Perhaps it will not become illegal in this marketplace or in the street. But they are likely to ban it in public places like stations, airports and cinemas - something many Muslims will regard as provocation in a Europe increasingly uncertain of its own identity. Find out what it means to be Muslim and what happens at mosques. Where do Muslims live and who are they? Use our clickable map. Are you a Muslim in the UK?